The UC Global Food Initiative’s Research to Policy working group aims to raise awareness of UC's role in informing policy related to food and agriculture, and to encourage researchers to engage with policymakers as part of UC’s public service mission. The working group published a report of case studies highlighting ways UC research has been used to inform or affect policies in food and agriculture. The report's main collaborators are the Berkeley Food Institute at UC Berkeley, World Food Center at UC Davis and Philip R. Lee Institute for Health Policy Studies at UCSF. When education officials were considering banning the sale of sodas, chips and candy in California’s K-12 schools, they called in UC Berkeley researchers to analyze the financial implications. Could schools afford to limit these lucrative items? The answer was surprising: Cutting the sale of junk food actually helped the bottom line because students were more likely to eat healthy, subsidized meals, a change that boosted federal funding to the state and improved nutrition. In short, it was a win-win. As a result of the work by advocates armed with data from this UC study, California became the first state in the nation to limit the sale of these kinds of unhealthy foods and beverages in K-12 schools. Body mass index studies of California students indicated a reduction in obesity after the policy change, fueling adoption of similar policies across the country. The 2010 Healthy, Hunger-Free Kids Act directed the U.S. Department of Agriculture to update nutrition standards for schools nationwide. That’s just one salient example of how University of California research is helping uncover answers to the nation’s obesity epidemic and other thorny food-related issues. Along with limiting access to junk food, how do you inspire children to make healthy choices? 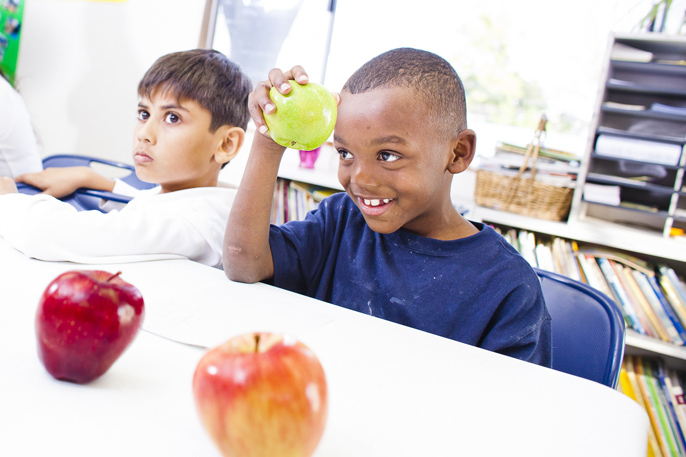 Sheri Zidenberg-Cherr, UC Cooperative Extension specialist in the Department of Nutrition at UC Davis, and colleagues designed a school-based program to nurture nutrition. During the first year that the Shaping Healthy Choices Program was implemented in Sacramento County schools, the number of children classified as overweight or obese dropped from 56 percent to 38 percent. Students also improved their nutrition knowledge, ability to identify vegetables and amounts of vegetables that they reported eating. “Simply offering healthy options is not enough to motivate children to make healthy choices,” Zidenberg-Cherr said. The average American consumes 45 gallons of sugary drinks per year. Liquid sugar, such as in sodas, energy drinks and sports drinks, is the leading single source of added sugar in the American diet. And there's growing scientific evidence that it's the most dangerous way to consume added sugar. UC research is helping provide healthier beverage choices for California preschoolers in child care. UC Agriculture and Natural Resources’ Lorrene Ritchie conducted a study that found a substantial need for improving the beverages served to young children in licensed child care. That helped lead to the Healthy Beverages in Child Care Law (AB 2084), aimed at offering alternatives to sugary drinks. This law currently stands among the most comprehensive of any state laws on child care beverages. After follow-up research found the need to raise awareness of the law, the Legislature passed AB 290, requiring that newly licensed child care providers receive at least one hour of child nutrition training starting in 2016. Meanwhile, UC San Francisco, whose SugarScience initiative informs the public about sugar and its impact on health, has set an example by launching a Healthy Beverage Initiative. UCSF will sell only zero-calorie beverages or non-sweetened drinks with nutritional value, and will phase out the sale of sugar-sweetened beverages in its onsite cafeterias and food vendors, vending machines and retail locations. UCSF is the first university to implement this strategy across both its medical center and campus, and other institutions in San Francisco are following suit. It’s 3 p.m. You’re looking for a mid-afternoon snack. You go to a vending machine expecting to see only chips, cookies and candy bars. Instead, you also find nuts, trail mix and air-popped snacks. What do you choose? It turns out that when offered healthier items, people respond positively. Policymakers, looking for ways to improve population health, can learn from a vending machine study by UCLA, believed to be the first of its kind on an American college campus. In collaboration with UCLA’s Housing and Hospitality Services, members of UCLA’s Healthy Campus Initiative planned, implemented and evaluated a pilot vending machine program aimed at encouraging customers to choose healthier items over conventional items without compromising the financial viability of the machines. The study showed an improved likelihood of purchasing something healthier without losing revenue or profit. When surveyed, many respondents said they would like to see more healthy snacks in campus machines. The research is now being used to inform the vending operations across the UC system, as part of the UC Global Food Initiative, and could be applied more broadly as well. How can we improve living standards for those on the lowest rungs of our nation’s economic ladder? Seven of the 10 lowest-paying jobs in America are in the food industry. Saru Jayaraman, director of UC Berkeley’s Food Labor Research Center and co-founder of Restaurant Opportunities Centers United, wants to change that statistic. She has been employing academic tools, analyzing government data and surveying workers to help persuade policymakers in states from Minnesota to New York to introduce bills ending the subminimum wage for tipped employees — who make as little as $2.13 per hour in many states. Another study by UC Berkeley and UC San Francisco researchers found widespread violations of minimum wage labor laws for restaurant workers in San Francisco’s Chinatown. The report revealed that half of workers reported being paid less than minimum wage, and two-thirds were not paid overtime. The findings sparked community outrage, media attention and legislative action: San Francisco became the second city in the country to enact a wage theft law. When you turn on your tap, how safe is your water? One in 10 people living in California’s Salinas and southern San Joaquin valleys is at risk of exposure to harmful levels of nitrate contamination in their drinking water from agricultural runoff, according to a report released by UC Davis. The report, commissioned by the California State Water Resources Control Board, is the first comprehensive scientific investigation of nitrate contamination in the Salinas Valley and the Tulare Lake Basin. It defines the extent of the problem, suggests promising solutions and outlines possible funding mechanisms. Invasive species cause an estimated $3 billion a year in losses to California each year — and larger damages loom. A tiny pest called Asian citrus psyllid is a top concern of California’s $2 billion citrus industry. The invasive insect can transmit the bacterium that causes huanglongbing, a devastating disease of citrus trees that has caused $2.9 billion in damage to Florida’s citrus industry. The psyllid was first detected in California in 2008, and quarantines are now in place in 17 counties, with huanglongbing having been detected twice in the state. Elizabeth Grafton-Cardwell, a UC Cooperative Extension specialist in the Department of Entomology at UC Riverside, and UC colleagues are working with the state and citrus industry to minimize the pest’s impact. This effort includes surveys for the pest and disease, pesticide treatments where the psyllid is found, new regulations controlling fruit and plant movement, research to find a cure for the disease, and education aimed at helping farmers. Are wild plants at risk of contamination from genetically modified crops? UC Riverside plant geneticist Norman Ellstrand has spent more than 25 years considering the possibility and potential impacts of unintended gene flow from genetically engineered crops. Ellstrand maintains there’s no fundamental difference between genes transferred from genetic engineering and genes that are transferred by other means, such as traditional breeding. Ellstrand’s research and his book on the topic are widely cited in policy publications, including National Research Council studies. Millions of Americans live in low-income areas that lack access to fresh, healthy and affordable food. Instead of farmers markets and grocery stores, their food options may be limited to convenience stores and fast food restaurants. What’s a healthier alternative? In southeastern San Diego, local residents are transforming a 20,000-square-foot vacant urban lot into a community focal point for healthy living. The Ocean View Growing Grounds offer a gathering place for people to grow food, socialize with their neighbors and hold events. Neighbors active at the site are partnering with nonprofit groups, UC San Diego researchers and students to address public health problems from obesity to environmental degradation. UC San Diego’s Keith Pezzoli leads a project that includes supporting the cultivation of community gardens, beginning with the Ocean View site. The city of San Diego sees the project as a model for interim use of a vacant lot, and their work has the potential to reach much farther.